Lake Poerua is a small lake situated between Rotomanu and Inchbonnie, approx 13 kms from Lake Brunner. Its outlet, the Poerua River, flows into the Crooked River, which in turn flows into Lake Brunner. The lake is quite shallow, particularly so down in the lower-end section towards the outlet and becomes very warm in summer. 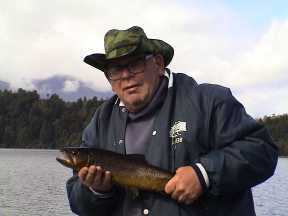 It has good stocks of brown trout, and these can be tackled with the same methods that work for Lake Brunner. When taking a boat out from the launching point, exercise extreme caution. Depending on water levels, there are stumps protruding above the surface, and for each of those you can see, there is one you cannot. The line of stumps extends quite way out from the shore line at the south end of the lake, and from the road-side all the way across to the foot of Mt Te Kinga. To complete the hazard notes, care must be exercised when travelling along the foot of Mt Te Kinga, as in several places there are huge granite boulders at or below water level, in some cases 30-40 metres from the shoreline. There are several small streams that enter the lake along the farmland (eastern) side. There will always provide a visible fish or two during the summer months, when trout take advantage of the cooler water and higher oxygen levels. 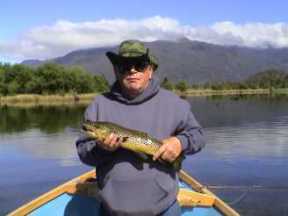 During heavy rains, fly fishing with a San Juan worm at the stream mouths can be excellent. Fish often congregate here, taking advantage of high water levels flushing worms, grass grubs and other tasty morsels into the lake. Often the lower end of the lake is a good place to fish in the afternoon when the daily westerly blows up. The willows, and the mountain provide an extra degree of shelter, and a sunny afternoon can provide good visibility. The main lake narrows down into a shallow, willow-lined channel, some 200 metres long, and it can be difficult to navigate at low lake levels. Persevering will bring you out into another bay, of surprising extent and very shallow. There is a small stream entering the lake on the east side about 150 metres from the channel exit, and invariable there are 4-6 trout circulating around the stream mouth. A stealthy approach, Polaroid's, and patience... don't force a cast, they will always come around again.... I sometimes wait until they've turned and are moving off, and then scuttle a few metres closer - then cast and leave it lie still until the fish approaches, bringing the lure or fly to life as the trout comes within eyeball range..... Works almost every time!